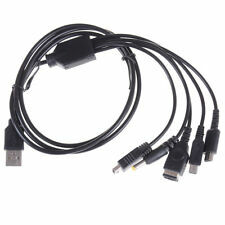 USB Charging Cable Charger for Nintend GBA SP WII U 3DS NDSL XL DSI PSP 5 in 1 ! Description: Wii U gamepad fast CHARGE ! With short-circuit protection and built-in overcharging protection. - Supply power to the Wii U game console - Exclusively designed for Wii U console - Short-circuit protection and built-in overcharging protection - Wide voltage input (AC 100-240V), which avoids the defect of using AC 110V - Simple and straightforward design - Works well with Nintendo Wii U gamepad Shell Material: ABS plastic Input: AC 100 - 240V 50/60Hz 230mA Output: 4.75V 1.6A Color: Grey Cable length: 110cm (43.3") Shell Material: ABS plastic Makes a great replacement or back up power for your Wii U Gamepad. . Exclusively designed for Wii U console. 1 x Power Adapter. Output: 4.75V 1.6A. Cable length: 110cm (43.3"). With short-circuit protection and built-in overcharging protection. - Short-circuit protection and built-in overcharging protection. Exclusively designed for Wii U console. 1 x Power Adapter. Input: AC 100 - 240V 50/60Hz 230mA. With short-circuit protection and built-in overcharging protection. - Short-circuit protection and built-in overcharging protection. 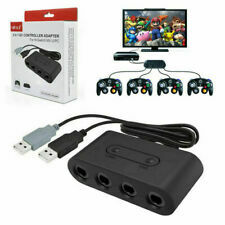 Product description The gamecube controller adapter is your best choice to play Super Smash Bros on wii u.Up to eight GC controllers use at the same time(Need two adapter). Support Wii u,PC,Switch and Mac.Easy switch the wii u/pc button located on the side,No driver need.Just fun play with the gamecube adapter. Note:If you want to play on switch,The system need up to 4.0 and the Gc controller's button is less than switch controller.So,some game's fumction may not work. Updated Version.The newest chip design.Japanese expert R&D.Beyond most gamecube controller adapter. Product Dimensions:4.5 x 1.2 x 2.1 inches PACKAGE INCLUDE: 1x Gamecube adapter 1 x Instruction manual. Description Wii U gamepad fast CHARGE ! With short-circuit protection and built-in overcharging protection. - Supply power to the Wii U game console - Exclusively designed for Wii U console - Short-circuit protection and built-in overcharging protection - Wide voltage input (AC 100-240V), which avoids the defect of using AC 110V - Simple and straightforward design - Works well with Nintendo Wii U gamepad Shell Material: ABS plastic Input: AC 100 - 240V 50/60Hz 230mA Output: 4.75V 1.6A Color: Grey Cable length: 110cm (43.3") Shell Material: ABS plastic Makes a great replacement or back up power for your Wii U Gamepad. Package Includes: 1 x Power Adapter. Exclusively designed for Wii U console. 1 x Power Adapter. Output: 4.75V 1.6A. Input: AC 100 - 240V 50/60Hz 230mA. Cable length: 110cm (43.3"). With short-circuit protection and built-in overcharging protection. Internet access via cable network for your Nintendo Switch, Wii U, Wii. Faster connection than WiFi. 1 x USB LAN Adapter. Connectors: 1 x RJ-45 jack. Eliminate dropped or no signals from wireless networks. 3M extra long charging cable lead for Nintendo Wii U Controller - White Extra long 3 metre charge cable for the wii u gamepad /controller. 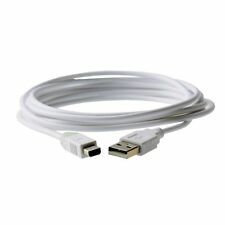 You will receive the following: 1x 3 metre long charge cable for the wii U. Original Nintendo make (WUP-011). tested and working no problem. in great condition. It's easy to use and just needs to be plugged into any USB port on a computer or notebook simple. SmartPhone Accessories. Garmin Accessories. Tablet Accessories. Fitbit Accessories. Product picture is for reference only. We don't hold any responsibility to the color difference and will not accept about such related complaint. -Made by Third Party. Fully working and tested bargain price wont last long. Features: 100% brand new and high quality Nintendo GameCube controller adapter converter for using GameCube controllers on the Nintendo Wii U. Allow you to connect to four GameCube controllers(or wireless GameCube controllers) to Wii U system and PC USB Compatible with Windows 2000,XP, Vista, Windows 7/8/10, 32bit and 64 bit and Mac OS under PC mode. Easy to switch between "Wii U " and "PC" mode by the side button USB connection for the Wii U console - 1m lead included. This is a high quality Scart HD AV cord cable for Nintendo Wii & Wii U Video game. Experience games with high performance video and full stereo sound with this RGB Scart video cable. This high quality scart cable provides higher definition than s-video and the convenience of a single plug to carry all the signals. Scart ensures optimum pin sharp picture quality. Compatible for both Wii and WiiU consoles. Excellent replacement for the original. High transmission rate, superior picture quality. Technical Information:- • Compatible with Wii and Wii U. 1 x Power Adapter. We try our best to provide you happy solution by communication. Output: 4.75V/1.6A. Input: 100-240V, 50/60Hz. This RGB AV cable is exclusively for use with Nintendo Wii console. Color of Cable & Connectors: Gray. Support 1080i / 720p HDTV system. Plug DC jack plug of the adapter into Wii u console. Connect your Wii u console with HDMI, IR sensor. bar and TV. Turn on the TV and Wii U console. it supports to use both AC 100v and AC 240V. Fast Dispatch. Made by Third Party. Product picture is for reference only. We don't hold any responsibility to the color difference and will not accept about such related complaint. Rate (item arrived). United Kingdom. Exclusively designed for Wii U console. 1 x Power Adapter. With short-circuit protection and built-in overcharging protection. - Short-circuit protection and built-in overcharging protection. Shell Material: ABS plastic. Features: 100% brand new and high quality Experience games with higher performance video and sound with this Wii AV cable over the original Wii cable. 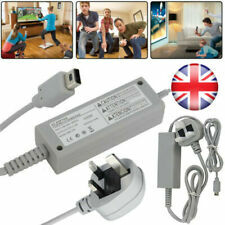 Compatible with both Wii and Wii U consoles, an economical replacement for the original AV lead. Fits and works perfectly with Nintendo Wii U system! Nintendo Wii U systems, or with Nintendo Switch systems when using a docking station. Genuine Nintendo item! Tested and in perfect working order! Genuine Nintendo Wii U HDMI Cable Full HD 1080P WUP-008 in a good used condition. 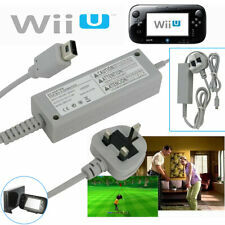 High quality AC power adapter for Nintendo Wii U Console. 1 AC Adapter for Nintendo Wii U Console. Compatible with: Nintendo Wii U. Durable cable with strong shell. Adapter Type: EU/US Plug. Output: DC 15V 5A. 1 x Power Adapter. Output: 4.75V/1.6A. remote area code, you need to. We will try our best to minimize the custom duties. We will do our best to solve problem ASAP. If you have problems like. Description： 100% Brand new and high quality.